The new 55-ton ‘Scorpion,’ with the biggest caliber machine-gun in Russia, will smash through enemy defenses and clearing minefields. 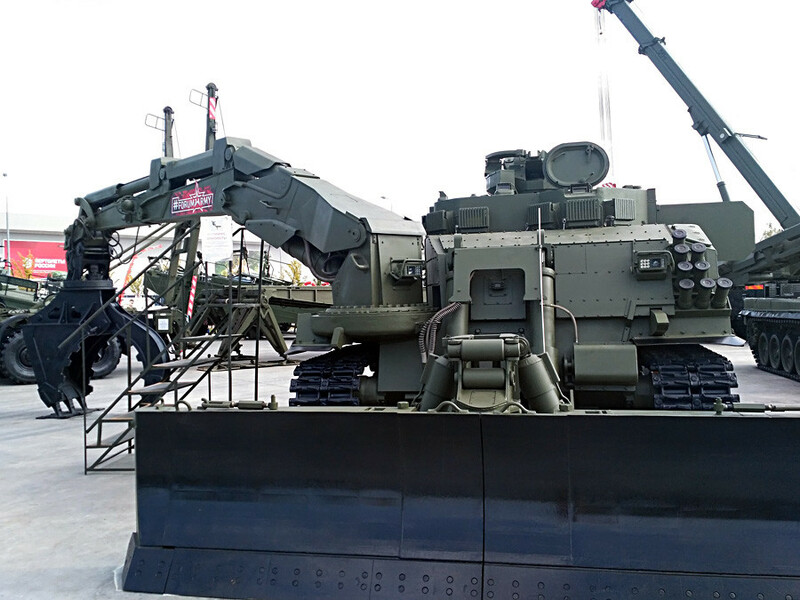 In early September, Russian designers presented a new multi-purpose armored engineer vehicle (UBIM), which the country’s media instantly dubbed a "battle scorpion" for its aggressive look and "stinger," which it uses to clear rubble. The vehicle was made by Uralvagonzavod, Russia's leading manufacturer of heavy armored vehicles, which also created the new T-14 Armata tank. The "Scorpion" combines the functions of three engineer vehicles: It’s designed for rescue and repair, obstacle-clearing, and mine-clearing operations. One of its key features, which makes the Scorpion different from its predecessors, is its ability to operate under enemy fire while removing rubble and mines. According to the manufacturer, it can even operate in radioactively contaminated areas. The vehicle can easily navigate stone or wood debris thanks to a 1,130 horsepower engine and a 4.5-meter wide dozer blade, which can demolish obstacles like a hot knife through butter. Furthermore, the dozer blade can be replaced with a hydraulic hammer, which can grind monolithic blocks into dust. In another modification, with an excavator bucket with pincers at the end, the vehicle is able to clear any rubble and even help to rescue people in a disaster zone. "In battle, the vehicle can independently navigate minefields planted with electromagnetic bombs. The UBIM can cut down trees and pull stumps when cutting trails through bushes and undergrowth, and can lay road surfaces for vehicles to pass through difficult terrain," an official representative of Uralvagonzavod told Russia Beyond. In winter, the Scorpion will be able to lay roads through snow standing at a meter and a half high. Due to its reinforced armor and attachments, the vehicle weighs as much as a tank - about 55 tons. However, it’s bulk comes in handy when doing engineering work. To allow it to operate under enemy fire and clear minefields in war zones, where each movement is monitored, the vehicle's electronic equipment includes a radio transmitter that operates in a masking mode and provides communication with the base or a support point at a distance of 20 km. The vehicle has a mounted 12.7-mm machine-gun in case it needs to engage with the enemy: The slugs can rip through brick houses. The machinegun is controlled remotely - the crew can stay in the armored capsule, direct fire, and see everything happening in real time on their computer screens. The machinegun has modern sights, including television and thermal imaging channels, as well as a laser rangefinder. Neither night nor torrential rain will be a hindrance to the crew - they will see the enemy perfectly well in any conditions at a distance of up to 5 km.